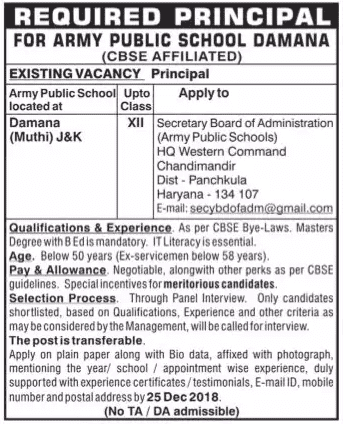 Army Public School, Damana (Haryana) has recently given a notification of 01 Principal Vacancy. You can apply for the APS Damana Recruitment 2018 on or before 25.12.2018. Name of Department: Army Public School, Damana (Haryana). Army Public School Damana Recruitment 2018-19 latest notification is out. As per the Notification, there is 01 Principal Vacancy. The educational qualification is as per the CBSE Bye-Laws, Masters degree with B.Ed. The maximum age limit is 50 years. If you are looking for Teaching Jobs in Army Public School Damana then this article is going to be very helpful for you. As per the CBSE Bye-Laws for all the posts. Master’s degree with B.Ed. is mandatory. IT Literacy is essential. The maximum age limit is 50 years and 58 years for the Ex-Servicemen. As per the Haryana Govt. norms. Negotiable, along with the other perks as per CBSE guidelines. Special Incentives for meritorious candidates. The selection is going to be on the basis of interview. Only candidates shortlisted based on qualifications, experience, and other criteria as may be considered by the Management will be called for the interview. You can send your applications to Secretary Board of Administration (Army Public Schools) HQ Western Command, Chandimandir, District Panchkula (Haryana) – 134107 (Email: secybdofadm@gmail.com) along with the Bio-Data, affixed with the photograph, mentioning the year/ School/ Appointment wise experience duly supported with experience certificates/ testimonials, Email ID, mobile number and postal address on or before 25.12.2018. You can check the APS Damana Result or Interview List from the official website.